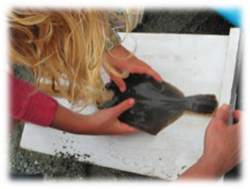 To provide students on Orcas and Lopez Islands with K-12 science outreach opportunities 'Partners in Science' was formed in 2004 by the San Juan Nature Institute. The program is modeled after FHLSOP and we work closely with the San Juan Nature Institute staff. 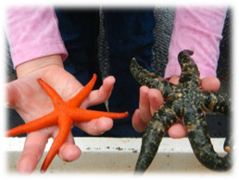 To learn more about the 'Partners in Science' program go to the San Juan Nature Institute web site. FHLSOP staff are available to work with students from visiting schools. Please look at our list of potential offerings below, but don't feel limited, we are willing to work with you to design something that works for your class. Costs range according to class size, activity(ies), and hours (or days) spent engaging in activities at FHL. Please refer to our School Programs page for details on offered projects. Contact Jenny Roberts at FHLSOP for details about designing your tailor-made program.